The change certainly didn’t come anywhere near as soon as Barritt had hoped, but the time for ‘Red Delicious’ to cede the top spot is officially coming to an end. 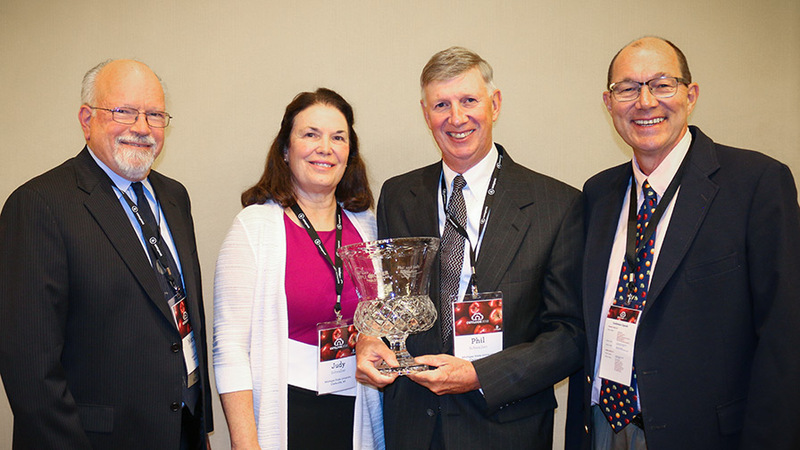 The announcement that the ‘Gala’ variety will take the top spot was made at the annual Apple Crop Outlook & Marketing Conference in Chicago, hosted by the U.S. Apple Association (USApple), where the Apple Growers of the Year, Phil and Judy Schwallier, were honored. For this coming year, the USApple forecast for ‘Gala’ is 52.4 million 42-pound units, just ahead of 51.7 million for ‘Red Delicious.’ Other varieties follow far behind. Rounding out the top five are: ‘Granny Smith’ at 25.5 million, ‘Fuji’ at 25.2 million, and ‘Honeycrisp’ at 23.6 million. The rise of the super-crunchy ‘Honeycrisp’ has been remarkable, particularly when compared to older varieties. For example, just five years ago its production barely exceeded that of ‘Rome,’ but in 2018 it’s supposed to be about triple that of America’s traditional baking apple. As for this year’s total crop, USApple predicts it will be down 6% from 2017, and down 2% from the five–year average. That’s mostly due to the fact the state of Washington, with two-thirds of the nation’s total, is expected to be down 13% from last year’s monster crop. 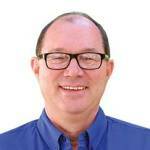 Besides the changing of the guard in varieties, one other development this year is that huge crops have become the new norm, said USApple’s Director, Regulatory and Industry Affairs Mark Seetin. The average for the last five years’ crops is 267 million boxes/bushels, exceeding the past record of 259 million. Interestingly, the previous record was set back in the mid-1990s, when the nation’s apple industry was very different. For instance, ‘Red Delicious’ production hit a high of 118.2 million units in 1994. Only about half the total crop went for fresh market back then, while today it’s two-thirds. Apple acreage was at its peak. Shortly after, the U.S. apple business hit rough times and production slowed. Acreage has never rebounded to those days and won’t in the foreseeable future, but only because per-acre yields have soared because of modern growers’ intensive plantings. Today, the industry can handle these larger volumes, Seetin said, adding that he shudders to think of the reaction he would have received at the Outlook Conference if he had posted these five-year production averages a couple decades ago. “Growers in the audience would be facing liquidation,” he said. Nearly 300 industry leaders from the U.S. and around the world attended the Outlook Conference — from all segments of the apple industry including production, packing, processing, sales, marketing, and new products. 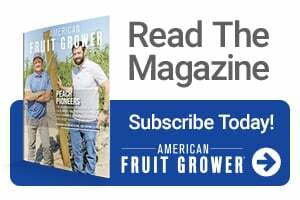 Each year, American Fruit Grower® and Western Fruit Grower® magazines honor the Apple Grower of the YearSM. This year, the award, which as usual included a video tribute, went to the husband and wife team of Phil and Judy Schwallier of Sparta, MI. Besides being top-notch growers, Phil Schwallier is a Michigan State University Extension advisor, and Judy Schwallier runs the family’s very successful farm market. The award was presented by Mark Mason, Tree Fruit Crop Manager with the award sponsor, Valent USA. Mason noted the Schwalliers’ Mason noted the Schwalliers’ are committed to being consummate growers, and then saluted them for their additional contributions. In accepting the award, the Schwalliers were typically modest, and Phil, who spoke for both, was brief. “Have you looked at the list of people who are on this Apple Grower of the Year? Doyle Fleming, Darrel Oakes, Grady Auvil, John Rice, my gosh! Do you think we belong with them? They’re exceptional people, great achievements, and the finest growers and citizens in the apple industry that you can find,” he said.